Dallas Sherringham discovers that when travelling through central Queensland, make sure you leave a day or two spare to learn the unique story of Barcaldine. 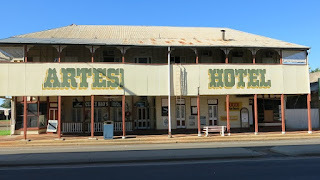 You see, this unpretentious town of 1000 residents, full of lovely old pubs and Queensland bush houses is a place where nation changing history was made. 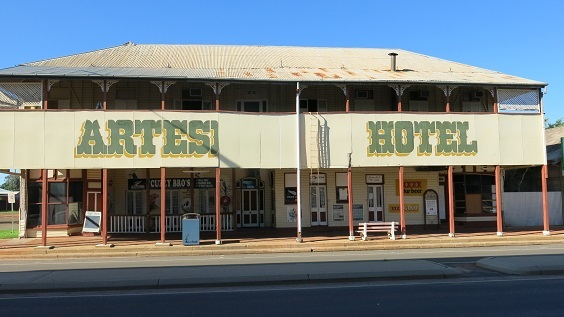 Barcaldine played a significant role in the Australian labour movement and the birth of the Australian Labor Party. It all happened in 1891 when it was one of the focal points of the Australian shearers' strike, with the Eureka Flag flying over the strike camp. 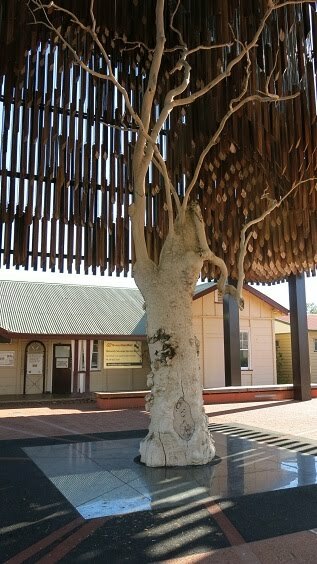 The landmark Tree of Knowledge, under which the strikers met, took pride of place outside the railway station. In 1892 the reading of the Labour Party manifesto under its shady branches led to the formation of the ALP. Sadly, in an act that defies logic, in 2006 unknown vandals poisoned the beautiful old tree with the herbicide Roundup, which led to its sad death. The tree was a 200-y-o ghost gum when it died. It was always a feature of the town since the very early days of settlement. Barcaldine was a natural focus for the development of unionism in the Australian bush. As the railhead, the town drew many seasonal and casual workers. 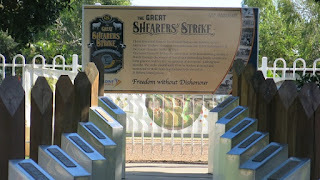 Besides shearers and hands there were navvies who had worked on the construction of the railway. The coming of the railway had destroyed the income of many carriers who had found their work reduced by it. Difficulties in finding work and financial hardship helped to build a sense of mateship and mutual support amongst sections of them. 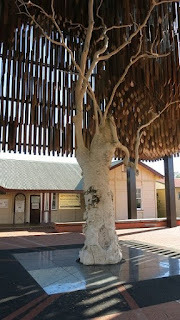 In 1887 the Central Queensland Carriers Union was formed, and discussions leading up to this were held under the gum tree which provided shade where carriers waited at the front of the railway station. 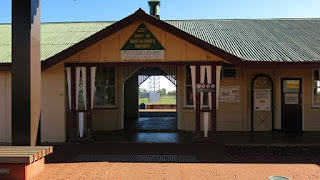 At the same time, the Queensland Shearers' Union was formed at Blackall. Within a year it had 1300 members, indicating a need for collective bargaining to obtain fair pay and working conditions. In 1888 the Central Queensland Labourers' Union was formed at Barcaldine. These three unions were the driving force behind the strike of 1891. Tensions simmered and threatened to turn into a major conflict between police and striking workers. One of the first May Day marches in the world took place during the strike on May 1 1891 in Oak St, Barcaldine. The Sydney Morning Herald reported that of the 1340 men who took part, 618 were mounted on horses. Banners carried included those of the Australian Labor Federation, the Shearers' and Carriers' Unions, and one inscribed 'Young Australia'. The leaders wore blue sashes and the Eureka Flag was carried. The Labor Bulletin reported that cheers were given for "the Union", "the Eight-hour day", "the Strike Committee" and "the boys in jail". Ultimately the strike petered out and the workers went back to work. However the seeds of a great labour movement had been sown. Today the whole event is commemorated in a major display surrounding the restored remains of the dead tree. A giant wooden structure covers the tree and looks ungainly when you first sight it. However inside, standing next to the tree remains, you look at a "cathedral type" structure which shuts out the everyday world. Nearby the words of the working class hero Henry Lawson steal the show. 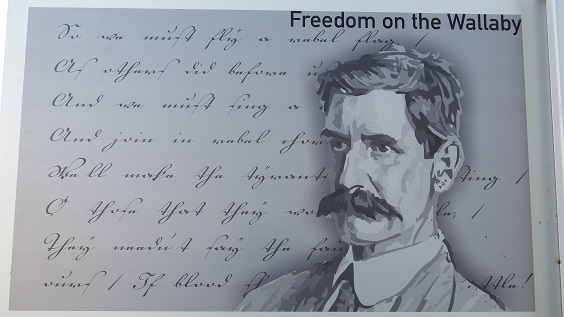 It shows his original hand writing capturing the immortal words of the poem "Freedom on the Wallaby". Lawson wrote the poem on hearing of the strike and it was published soon after. The "rebel flag" was the Eureka flag first flown at the Eureka stockade. And join in rebel chorus. If blood should stain the wattle! Nearby is the Australian Workers Heritage Centre which is being developed to celebrate the role of ordinary working class people in our society. The centre tells that working-class Australians fought the wars, built the nation, became great leaders and Prime Ministers and dominated the sporting fields. Surrounding a bore fed Billabong; it is set in 14 buildings on a former state school site. Barcaldine also has a number of heritage-listed sites, including: Barcaldine Shire Hall and Barcaldine War Memorial clock in Ash Street, the Lagoon Creek Shearers Strike Camp Site, Barcaldine Masonic Temple in Beech Street and St Peter's Anglican Church and Hall in Elm Street.